Yes the Washington Square, Oregon store is closing but no date is given yet. Still things are getting weird, it has to do with Nakajima closing all it Sanrio stores, the only ones that will be left are five or so Sanrio owned stores. In other words, there probably be more store closings. The owner of the Washington Square will retire. She said something about Nakajima license to market Hello kitty was pulled and the problem with counterfeit goods. Did Nakajima decide to end licensing of Sanrio products or Sanrio pulled the license? The plot thickens. 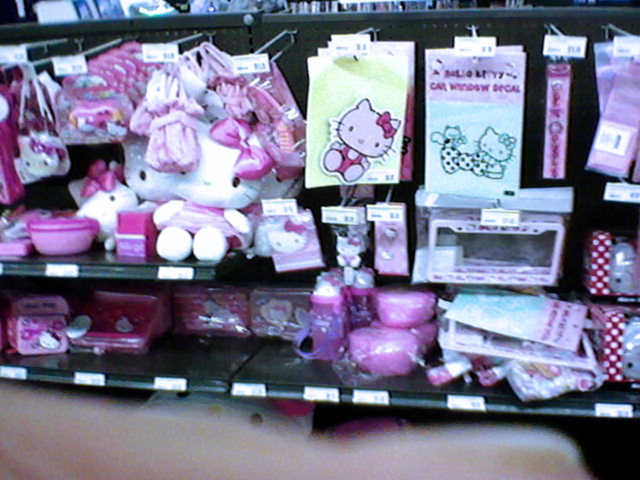 One more thing, it has not escape me how Hello Kitty item are now being sold outside the boutique store like what I say at Fry’s today. This entry was posted in Business, Sanrio and tagged Nakajima, sanrio, scandal, store closing by Actonrf. Bookmark the permalink.